Although Gantt charts are at the superheroes of visual planning, they sometimes need a sidekick or two. In Ganttic, the reports are the sidekicks. And while regular reporting is a great tool for optimizing and analyzing, it's always good to have something visual to summarize the data as well. That's where visual reporting using charts comes in. Charts are a great addition to your regular reports. They sum up the data to give you the best possible overview of everything that's going on. In Ganttic, it's always about your data and what you want to do with it. You can use the charts to report to upper management. If you are the upper management, you can use the charts to summarize the data and to make financial decisions based on it. As a manager, you can decide if the department or the team can take on a new project. You can see if you need to take on new resources to optimize the workload. You can see where the resources need to be reallocated. Charts are generated using task data. You can group the task data using the fixed fields like project title and busy time or custom data fields you have added. You can change the chart type after selecting the data fields, the time period etc. The list of charts will open. A new tab with the chart template will open. You can edit it later. If you choose private, only you are going to see the template you are creating in the list of charts. Doing so, all the actions will be saved. These are the values that are used for generating the chart. This is the data that is used for grouping the chart values. Since all the data is task related, you don't have to choose a label here. 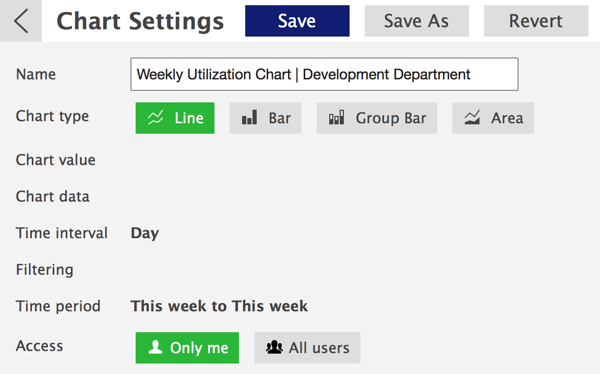 If you decide not to, all the task data will be used for generating the chart with no groupings. Doing so, all the changes will be applied to the chart. Select the desired data from the list that appears. You can add multiple filters, and change or delete them later. Doing so, the filter will be applied to the chart. These are the most popular time periods for reporting in Ganttic. You can do so by selecting a start time and an end time. You can choose between a day, a week and a month. The time interval is used for grouping the data. Grouping the data by a week or a month is a good idea for long-term reports. You'll see all the changes you have made. You can skip this step if you are happy with your choice. You have successfully created a chart template that'll appear in the list of charts. 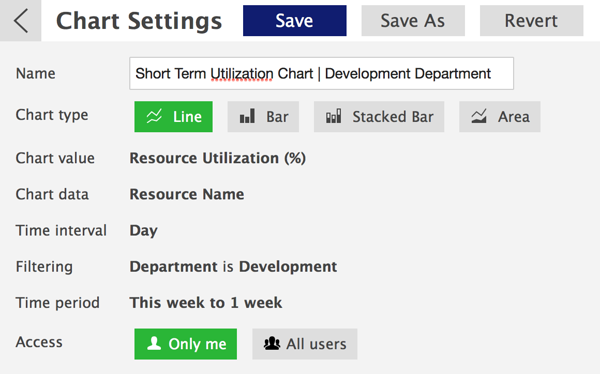 Creating a number of different chart templates is a good way to have a better overview of your resource plan. After you have saved the templates, you can just open one up from the list and click on 'Show chart'. You'll save time since you don't have to select all the fields etc every time you need to generate a chart. Did not find the answer to your question regarding visual reporting using charts?